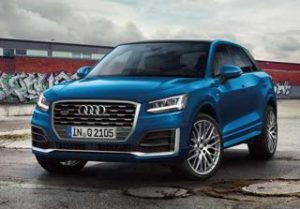 The Audi Q2 is a small SUV, it shares its underpinnings with the similar sized Seat Arona and Volkswagen T-Roc as well as the Audi A3 and VW Golf. 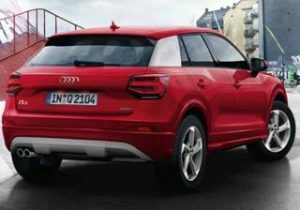 Audi has gone surprisingly off-piste in the styling department for the Q2, which makes for a look that will divide opinion, one comment being ‘the side profile has more lines than Clapham Junction’. At 4121mm long, the Q2 is 167mm longer than an Audi A1 and 116mm shorter than an A3. Among SUVs, it’s a smidge shorter than a Nissan Juke. The Q2 is comfortable up front as both the driver and front passenger seats come with manual height adjustment as standard, though lumbar support is £250 extra. The rear doors are small and access is tight, as is seating for three. The boot has a capacity of 405 litres which is pretty much on par for the class. The Audi Q2 comes in three trim lines, SE , Sport and S-Line. The SE has a seven-inch infotainment screen, DAB digital radio, Bluetooth and Apple CarPlay and Android Auto smartphone mirroring, rear parking sensors, cruise control, 16-inch alloy wheels and automatic emergency braking. Sport models offer 17 inch alloy wheels, sports seats and aluminium and gloss red interior trim. 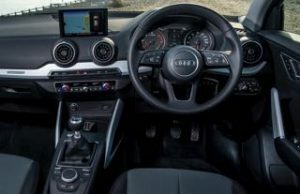 The same seven-inch infotainment screen as SE models also features satellite navigation as standard and the stereo comes with eight speakers instead of four. S-line models are the sportiest with 18-inch alloy wheels, LED headlights, remodelled bumpers and side skirts and matt grey exterior trim. Inside, you’ll find the same seven-inch infotainment screen with sat nav as Sport models, part-leather sports seats with embossed S logos, brushed aluminium trim and stainless steel pedals. Black Edition cars add 19 inch Black Alloy wheels, black c-pillar, privacy glass and anything that can be changed to black is. Across the range Dual-zone electronic climate control is a £525 extra, rear view camera £350, heated front seats £300, Adaptive cruise control £375, Park assist £450 and the Virtual Cockpit (12.3″ LCD instrument cluster) is part of the Technology Pack a £1395 extra on Sport and S-Line trims. Engines are the 1.0 litre 114 bhp three-cylinder turbo, 1.6 litre 114 bhp diesel and the new 1.5 148 bhp petrol all can be paired to a 6 speed manual or 7 speed twin clutch Automatic Gearbox. The entry-level 1.0 TFSI turbo three cylinder has claimed economy of 55.4mpg and a 0-62 time of 10.1 seconds. The 1.6 diesel can sprint to 62 in 10.3 and return up to 68.9 mpg as an automatic on 17 inch wheels while the 1.5 petrol cuts the 0-62 time to 8.5 seconds and return a claimed 49.5 mpg. In a new move the MY19 cars will no longer show the engine size on the badge but be badged as 30 TDI for the 1.6 diesel and 30 TFSi for the 1.0 litre petrol and 35 TFSi for the 1.5 petrol. All new Audi’s will be shown in this way, starting at 30 for engines up to 127 bhp then increases up to 70 for cars over 529 bhp. Strange. All engines are avaialble in all trims and there is even the Black Edition as a diesel manual for £1199 AP which is a nice option for the under 25’s.